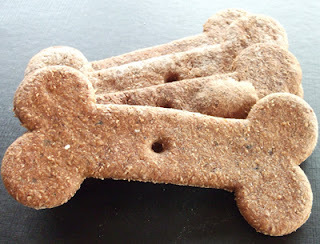 In Death by Association, A DIY Diva Mystery, Bessie always had one of these dog-bone treats waiting for Bear every morning when Laurel took him for a walk. Now that Bessie’s retired from her job as a security guard at Hawkeye Haven, she still makes Bear a care package of treats every once in a while. Notes: You’ll need a cookie cutter in the shape of a dog-bone for these treats. Bessie uses a 3 1/4-inch cookie cutter, but you can use another size, if you prefer. Since these treats contain a lot of fiber, monitor the number of treats your dog consumes! Line a baking sheet with parchment paper. Combine the sweet potatoes and olive oil in a mixing bowl. Sprinkle the cinnamon over the mixture and stir in. Add flax seed and stir. Add oat flour, ½ cup at a time, and mix well. Chill the dough for at least one hour. Preheat the oven to 400 degrees. Roll the dough to 1/8 inch thickness between two pieces of parchment paper. Cut out dog-bone shapes with your cookie cutter and place them on the on the parchment-paper-lined cookie sheet. Bake at 400 degrees for about 12 minutes or until the treats are done. Cool on parchment paper or a wire rack. Store the treats in the freezer. This recipe makes about thirty-two 3 ¼-inch dog-bone treats.